This page contains timeline information, as well as, the timeline assignments for each of the 4 Eras we study. 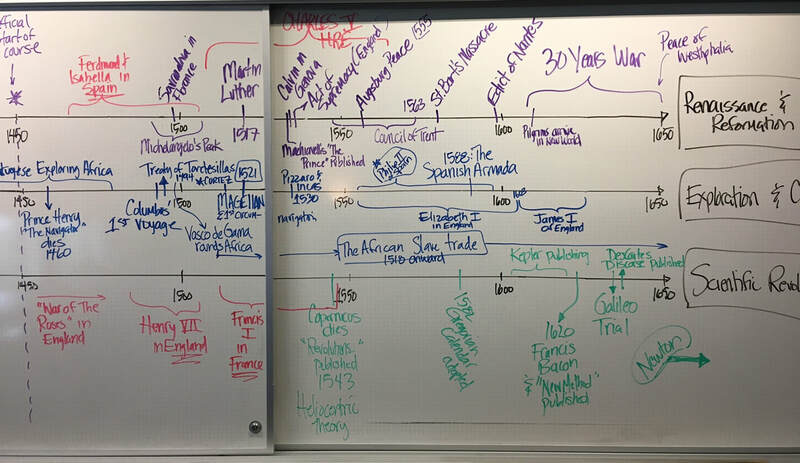 Understanding the chronology of history and the cause and effect of various events is critical to mastering the content and demonstrating your knowledge on the AP Exam. The documents located below contain the blank sheets and the information needed to complete the timeline assignment for the 2018-2019 school year. You can disregard the ones below, but I kept them in case you want to browse them for other potentially useful information for your studies. Note: This file also contains the information on the "Thematic Learning Objectives"
There are 4 Timeline assignments during the course of the year -- one for each of the 4 Eras of the Course. ERA 1: 1450 to 1648-- the first era starts with the Renaissance and ends with the Peace of Westphalia ending the 30 Years War. ERA 2: 1648 to 1815-- the second era runs from Westphalia to the Congress of Vienna ending the wars sparked by the French Revolution and Napoleon. ERA 3: 1815 to 1914-- the third era goes from Vienna to the outbreak of World War I following the assassination of the Austrian Archduke Franz Ferdinand. ERA 4: 1914 to 2001-- the final era includes World War One, World War Two, the Cold War and attempts to create a lasting peace in Europe. This PDF is from the AP Euro course guide and gives a detailed description of the Thematic Learning Objectives to use in your timelines. The links and images here are intended to be helpful in completing the timeline assignments and in studying the basic chronology of events of the course. This list is hardly exhaustive and if additional useful resources are found please let me know so I can add them. Below are two timelines that you might find useful -- finding more online has proven remarkably difficult! The files below ARE NOT the ones that go with the assignment from class -- but do contain a fairly exhaustive list of events from each era, in the event you are unsure about what events to include on the timelines due in class -- these files offer a good starting point.